Any of ya'll country music fans? Food fans? Food Network fans? ok well if you answered yes to at least the first two you'll have a good idea of where I'm going with this one. Trisha Yearwood has a cooking show on Food Network called Trisha's Southern Kitchen. 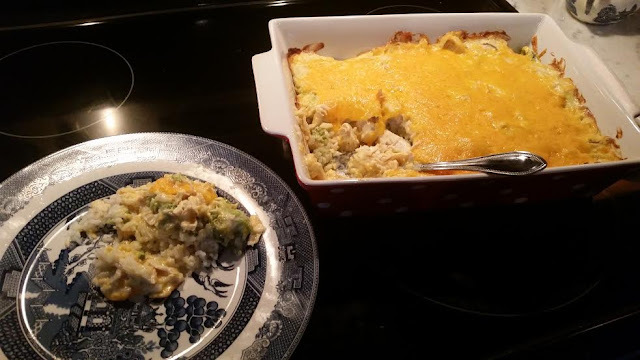 I wanted something easy and quick to fix for dinner this week that would also produce some good left-overs (aka excuse to not cook the next night) and her chicken broccoli rice casserole hit the spot! See below for the recipe and pin it for your next easy dinner at home night! Preheat the oven to 350 degrees F. Grease a 9-by-13-by-2-inch baking dish with nonstick cooking spray or butter. Place the chicken in a large pot with water to cover. Add some salt, bring to a boil, then reduce the heat to a low simmer and cook the chicken until tender, about 45 minutes. Drain the chicken, cover, and refrigerate until cool, or up to 24 hours. Shred. Meanwhile, bring a medium pot of generously salted water to a boil. Add the broccoli florets, and boil until crisp-tender, 2 to 3 minutes. 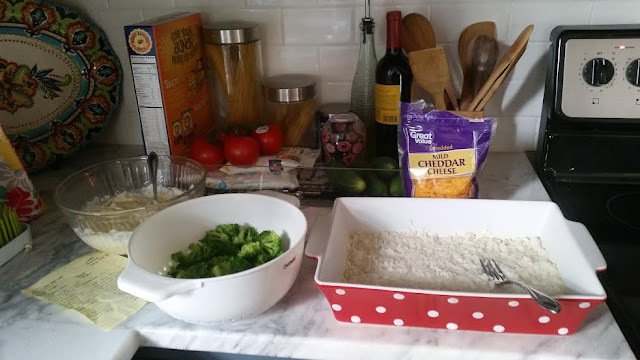 Spread the rice in an even layer in the baking dish. Make a second layer with the broccoli. In a large bowl, mix the chicken soup, the sour cream, mayonnaise, lemon juice, shredded chicken, half the Cheddar and some salt and pepper. Pour the mixture over the broccoli and top with the remaining Cheddar. Bake for 40 minutes; let stand for 5 minutes before serving. 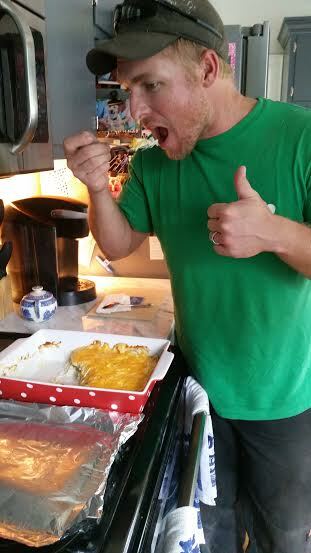 Husband Approved - so simple but SO good!! Oh my goodness, I LOVE Trisha's show. She cooks such yummy food and I LOVE that she sings at the end. She also has such fun guests, right?!?! This looks super yummy, glad the husband gave it a thumbs up :)! I love her show and always wanna try her dishes! I love a good casserole! Thanks for sharing! I love trisha's show and casseroles so this looks delicious! I think this would definitely be hubby approved in my messy/non glamorous kitchen too, ha! Yum this sounds good! Gotta love when it gets husband approved ahah! Yum yum yum! This looks so good! Being covered in cheese=amazing. Haha, I love the husband approved picture! This recipe looks so good, might need to try it out someday soon! I literally used to make this once a week ha. I'd totally eat the whole thing if I made it right now, but it's sooooo good. Yummy! pinning this for later!